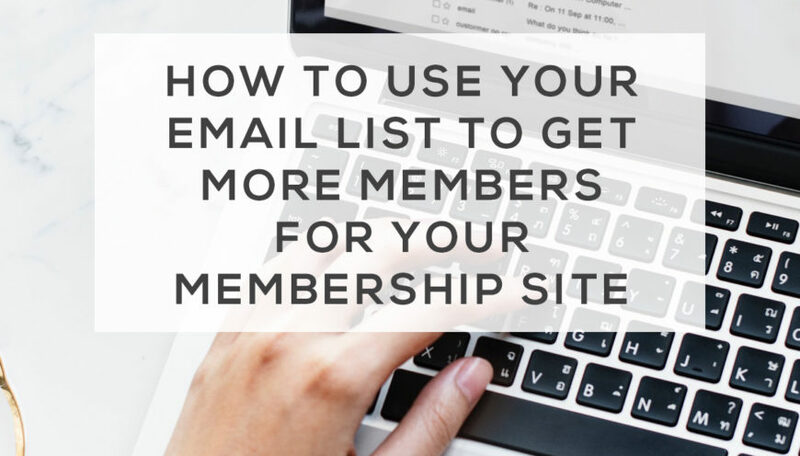 Whatever the subject of your membership website, your email list is the most powerful tool in your marketing arsenal, and if you’re not actively building and nurturing it then you are missing out. Many people make the mistake of thinking that building their social media presence is the most important marketing activity they can do. But you need to remember that you do not own your social media followers, and therefore you are in danger of losing all of your hard work. If a social media site shuts down (remember Vine? ), or changes its algorithm (like Facebook or Instagram), then you may find yourself in a position where you lose all your followers, or worse, they’re simply not shown the content you work so hard to create. However, you DO own your email list. As long as you follow best practices, and adhere to data protection laws such as GDPR, your email list is yours to contact directly whenever you need to. And because they have actively expressed an interest in hearing from you, you are much more likely to make sales and recruit new members. 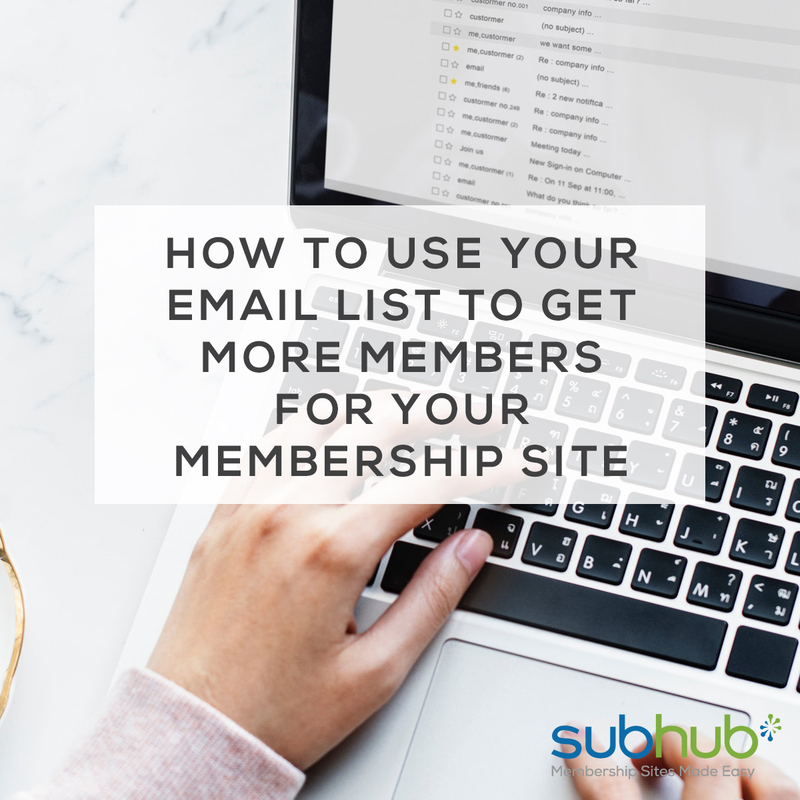 So how to you go about turning your email subscribers into paying members for your membership website? The first thing you need to do is make sure you have an easy way for people to give you their email address when they visit their site. We recommend a service like Mailchimp for managing the email addresses you collect and for sending out email campaigns (Mailchimp integrates seamlessly with your SubHub site as well). Place a simple sign up form strategically around your site – areas like your site’s footer, in your blog sidebar, the top right hand corner of your homepage, and at the end of each blog post have been proven to work well in terms of conversions. You might also want to consider having a separate landing page just for your newsletter (like we do here). As well as collecting email addresses from your website, it pays to encourage your offline contacts to sign up as well. If you hold in-person classes, or regularly attend networking events, then make sure you tell people about your newsletter and encourage them to sign up. Maybe have the URL of your sign up form on your business cards or flyers, or use a tablet or phone to invite people to sign up on the spot. There’s nothing more boring than the words ‘Sign up for my newsletter’. If you want to encourage people to sign up, you need to make the copy on your sign-up form compelling. Tell people why it’s worth their time and how they will benefit from getting your emails. It’s worth working with a copywriter to get this right. If you’re offering a free ebook or mini-course as a sign-up incentive, then put as much attention into creating and selling it as you would one of your paid offerings. If you want people to be compelled to make the transition into paying member, then you have to give them your best work, even if it’s for free. Email #1 – sent one hour after sign up: a thank you for signing up and an introduction to you (with a nice headshot). Email #2 – sent two days after sign up: a round up of your top three most popular (or most relevant to newbies) blog posts. Email #3 – sent four days after sign up: an invitation to email you with what results they’re looking for or what questions they’d like you to answer (this is great fodder for new content as well). Remember to respond to replies and be courteous and helpful. You want to encourage conversation and engagement with you and with your business. 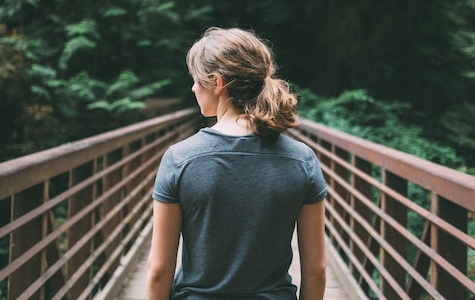 Consistency builds trust, and people won’t buy from you unless they trust you. Being consistent in your email shows that you are reliable and trustworthy. Pick a schedule for sending out your emails, and stick to it. You could decide to send anywhere from daily to once a quarter, depending on your business, but once a month is a good place to start. Put your sending dates in your calendar and plan out your content in advance so it fits in with your business goals and other promotional activities. Tell people when they sign up how often they’ll be hearing from you, and make absolutely sure you deliver on what you’ve promised. It’s a great idea to include a regular feature in your newsletter of what’s been going on in your members-only area. You could tell people about the new content which has been posted (or a teaser for upcoming content), you could share a few member wins/results, you could even discuss a question which a member asked in your forum. Show people how great your membership is, and don’t forget to include a call to action and a link to sign up for membership as well. Newsletters work best if you view them as a conversation, rather than a broadcast tool. So if you’re encouraging people to respond, make sure that you’re clear about when you are available and what your average response time is. Obviously, you don’t want to alienate your potential clients by ignoring their emails. We hope this has encouraged you to up your newsletter game. If you have any questions or have a story to share about how you use your newsletter with your membership website, then do drop us a line on Twitter or Facebook, or come and join our Knowledge Bank Group on Facebook. If you don’t have your own membership website set up yet then why not try our powerful membership site builder? Sign up for your free 14-day trial here.